Congratulate Guilin Hongcheng on the successful convening of the 2018 Sales Summary Conference, and create a brilliant future together. At the beginning of the year, it comes the Guilin Hongcheng annual sales summary meeting. 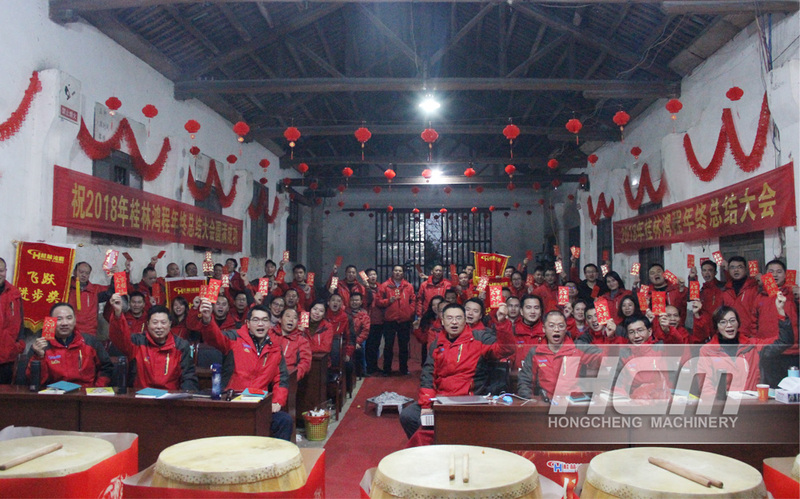 In order to summarize the marketing situation in 2018, plan and formulate new policies and goals comprehensively, and also to let the sales team remember the original intention of struggle and inspire their fighting spirit, Guilin Hongcheng's sales summary meeting in 2018 ushered in Shaodong, Hunan Province, from January 23rd to 24th, 2019. On the day of the meeting, senior leaders of Hongcheng and sales elites of various offices have stepped onto the red carpet, gathered in Shaodong, Hunan Province, summarized, discussed, exchanged and shared the overall sales situation in 2018, and shared their deep friendship. At the same time, they adjusted the market strategy in 2019, and jointly welcomed the new journey, negotiated grand plans and won the new future. Up to now, Hongcheng has been established for 13 years. In 13 years of cold and summer exchanges, Hongcheng team worked together, and its achievements soared, creating a brilliant Guilin Hongcheng. Today, we all go back to the place where the older generation of Hongcheng people fought. Looking back on that year, the older generation of Hongcheng people took the first step bravely and laid a promising future. Today, every Hongcheng family should bear in mind the founder's struggle heart and inherit the older generation's struggle spirit. Generations of Hongcheng people struggle hard, fight bravely, pioneer and innovate, work together in the same boat and forge ahead hand in hand with their spiritual feelings, and create brilliant achievements bravely, and create brilliance again! Every year's sales summary meeting is full of expectations, you can enjoy the morning meeting posture of Hongcheng team, which is striding forward with great strides; you can understand the brilliant achievements of Hongcheng team throughout the year; you can feel the spiritual outlook of this heroic team in summary and analysis, in sharing and gratitude, in learning and discussion. In the new starting point, the elite team of Guilin Hongcheng keeps the attitude of innovation, hard struggle and common aspiration, and creates a brilliant new future with concentrative force. 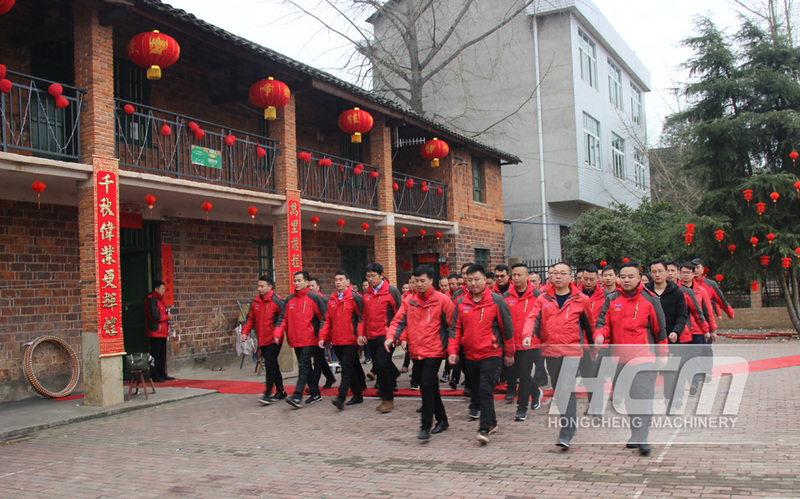 On January 24, facing the cold, this steel-like sales team gathered in front of the courtyard of the old house in Shaodong, Hunan Province, and jointly opened the prelude of the morning meeting training of Guilin Hongcheng. 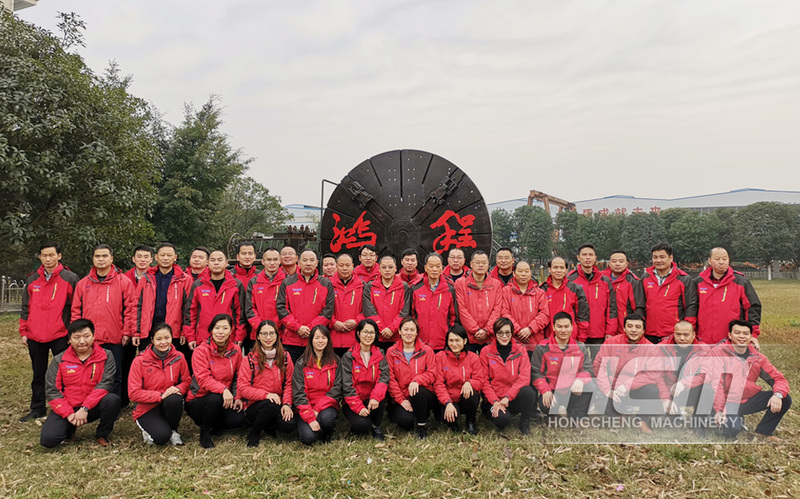 For Guilin Hongcheng sales team, strict discipline, steel-like will, meticulous working attitude, enthusiastic service level, excellent technical skills are indispensable spiritual qualities. Look, on the open ground, the sales team put on the red-hot charge uniform and stood in a neat and uniform formation. Under the direction of the instructor, they completed the morning meeting training contents such as swearing, singing company songs, line-up training and so on. The resolute oath, the powerful singing, the heroic line-up training moved every audience around them. In 2019, we are ready to start, not to lose the good times, and create brilliant! 2. Excellent steerer: Look ahead and create brilliance together! Every excellent team is bound to have an excellent leader who will lead the development course. Guilin Hongcheng is a group of excellent leaders who are far-sighted and planning. They are excellent steers of Hongcheng's march forward bravely and are leaders who draw grand blueprints and plot grand plans for development. At the sales summary meeting at the end of 2018, Mr. Rong Ping-xun, chairman of Guilin Hongcheng, Mr. Rong Beiguo, president, Mr. Rong Dong-guo, general manager, Mr. Rong Xinguo, executive vice president, Mr. Feng Kang, and other senior leaders attended the meeting. Under the guidance of the leaders, we have a clear analysis and summary of the marketing situation in 2018. At the same time, we have a clear summary of the marketing situation in 2019. Detailed arrangements and deployments have been made for the overall market planning and development plan of the year. In the coming year, while affirming the brilliant achievements of 2018, Mr. Rong also placed great expectations on the overall development of 2019 and gave important instructions. Leaders said: Families, in 2018, with the efforts of all Hongcheng people, we have achieved ideal results. Sales have increased by 33%, which cannot be separated from everyone's efforts and dedication. At the same time, we have also seen severe market challenges. 2019 is coming, this is a promising year of development. We hope that every person in Hongcheng will seize the opportunity, cohesion, break through the bottleneck, seek common development and create brilliance again. 3. report summary: objective analysis, refinement and discussion, to meet the future! In order to objectively and comprehensively analyze and summarize the achievements made in 2018, we also hope to find problems, analyze problems and solve problems in the summary, and scientifically and systematically lay out the work priorities and tasks in 2019. The heads of marketing department, sales department, foreign trade department, conference department, after-sales service department, wear-resistant business department, accessories Service Company and other departments have made brilliant summary reports. Through the exquisite and concise format of PPT pictures and text, detailed data, and rhythmic speech, they have brilliantly stated the brilliant achievements of 2018, and refined the focus of the work in 2019 according to the company's development strategy plan, which won warm applause from everyone. Mr. Rong said: 2019 is full of challenges and opportunities. He hopes that every department will plan as a whole and take precautions to work in an orderly manner around the tasks of 2019 and strive for creativity. Exchange and discussion is the most important part of the whole sales conference. We can explore the way forward in the summary. We can learn advanced management concepts and conduct ourselves in the sharing. We can make fierce ideological collisions in the exchange, express our own opinions and solve the difficult problems together. On the exchange site, every sales elite with the experience of 2018, the problems encountered and the outlook for 2019 came to the stage to speak. We all sat together to discuss new problems, new channels and new markets warmly, share successful experiences, actively seek solutions and make suggestions for improving the performance of 2019. Sales elite can be down-to-earth, strict self-discipline, absorb successful experience, improve working methods and strategies, enhance comprehensive literacy, and open up a more brilliant future. The society is progressing and the market is changing constantly. As a team in charge of the battle, we need to grasp more new products and knowledge from the perspective of the market. Only by constantly enriching ourselves and improving their comprehensive quality, can we keep pace with the development of the times, win market initiative with hard work and perfect knowledge system, and gain greater value. At this year's sales summary meeting, a lot of new training courses have been added. In order to help you understand the company's development trend and product research and development achievements, Hongcheng sent excellent tutors to train new product knowledge on-site, such as "Training and Exchange of Calcium Hydroxide Production Line", "Technical Exchange of Lime Deep Processing", "Application and Selection of Lime Mill", etc. Knowledge systems are reasonable. The courseware content with rich content and rich pictures and texts won warm applause from the sales elites on the spot. I believe that after precipitation and learning, we will be able to meet more opportunities and challenges and create brilliant market performance. 6. Honorary Award: Strive for achievement and create new highlights! 2018 is a harvest year; we have achieved success, won the market, and created brilliance, all of which are inseparable from the hard work and perseverance of every sales elite. Today, we want to give applause to the better one. In your expectation, Mr. Rong Dongguo, general manager of Guilin Hongcheng, personally announced the winning quota. In thunderous applause, the winners were announced to the public one by one. They are: the champion of the whole machine sales prize, the goal achievement prize, the leap forward prize and the accuracy prize of the whole machine sales plan. At this moment, everyone is convinced; at this moment, you and I are encouraging each other. Yes, the market is changing rapidly. Only by constantly learning, improving, innovating, steadfast and enterprising, can we stand firmly in the market and create our own brilliant achievements. In 2019, we have set sail. We will take the winners as an example, and strive hard, keep moving forward and achieve good results.